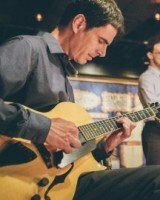 Award winning multi-instrumentalist, author and music educator Guy Fiorentini has been a regular on the Milwaukee music scene for over 20 years, working with many of the best blues, jazz, rock, and folk artists in the region. Four WAMI awards (“Best Band” and “Bassist of the Year”) celebrate a busy, in demand, working musician. Fiorentini also leads and plays guitar in the popular gyspy swing ensemble Milwaukee Hot Club, and has written two instructional play-along books for Hal Leonard Music. For over 20 years he’s been teaching people of all ages how to play and has 6 years of classroom teaching experience as well, in the Milwaukee and Wauwatosa Public School Districts. Many of his current and former students play professionally.